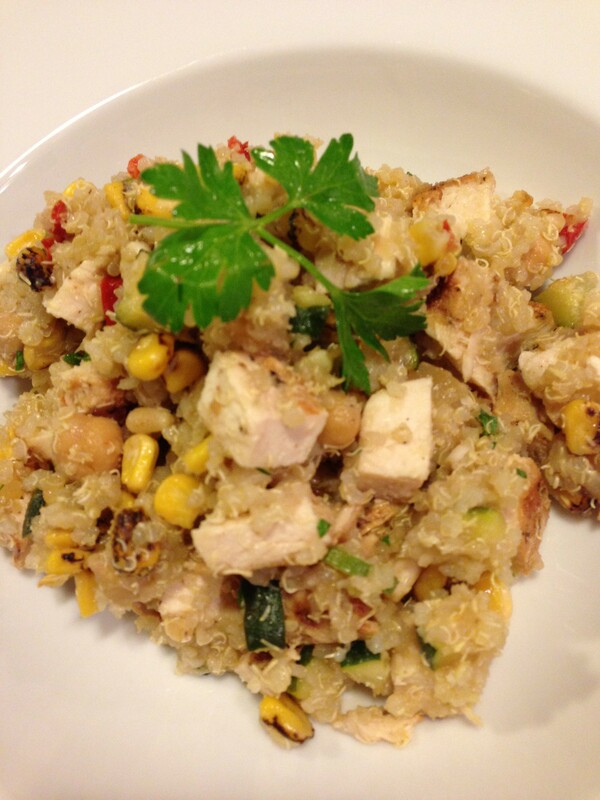 A nice chilled summery salad, my Quinoa Salad with Grilled Chicken and Roasted Corn is a great way to limit your “cooking” on a hot day. 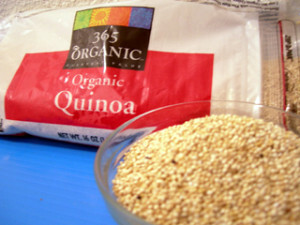 Quinoa is a great gluten-free option to other grains. Last week, my local Whole Foods Market‘s prepared foods section was selling a nice vegan quinoa salad that contained grilled zucchini, corn, chickpeas, and some pine nuts with a light lemon parsley vinaigrette. It was pretty tasty, so I decided to buy some quinoa and make my own salad. As someone who likes a hearty chilled salad, I prefer to have a bit of protein in the mix, so I like to add some beans or some chicken. 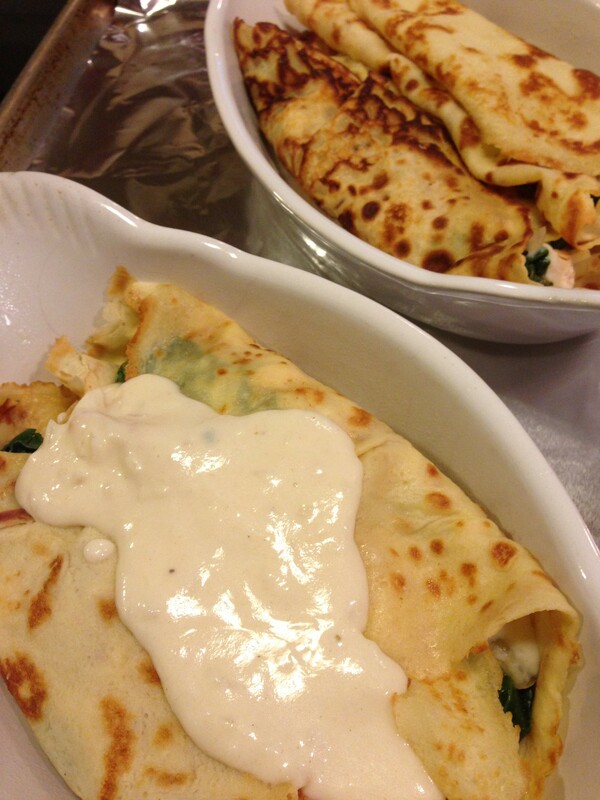 This is a great way to use up leftover grilled or baked chicken. Start this salad the day before so you can give it adequate chilling time. For this salad, grill a marinated chicken breast on your outdoor BBQ grill or inside in a grill pan, saute some chopped onions, red bell pepper, zucchini, and minced garlic in some olive oil. Add some Trader Joe’s frozen Roasted Corn, a quarter cup of Trader Joe’s toasted pine nuts, some chickpeas, a handful of chopped parsley, some olive oil, and a flavored vinegar. 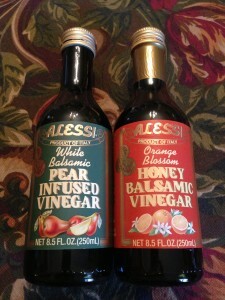 I like to use the Alessi Orange Blossom Honey Balsamic Vinegar orange blossom honey balsamic flavored vinegar for this salad. You can use any flavored vinegar that you prefer. After cooked ingredients have cooled, mix and then chill the salad for at least 6 hours or overnight. Serves 4! 1. 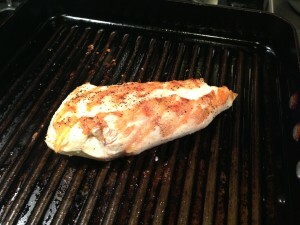 Pound out the chicken breast to 1/4 inch thick and sprinkle with salt and pepper on each side. 2. Mix together the lemon juice and olive or canola oil. Marinate the chicken in the liquid in a Ziploc bag in the refrigerator for at least 2 hours. 3. Grill the chicken breast until cooked. Set aside to cool. 4. Rinse the quinoa well under cool running water in a fine mesh strainer. Drain well. Then, cook the quinoa according to the package directions. For this recipe, you can combine 1 cup quinoa to 2 cups water or chicken broth/stock, bring to a boil, lower heat, cover and cook for 15 minutes or until the germs have “popped” out of their grain hulls. Set aside to cool. 5. 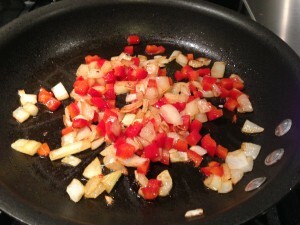 Over medium low heat, in a non-stick pan, saute the diced onion and red bell pepper in the olive oil until the vegetables are slightly caramelized. Add the minced garlic and stir. 6. 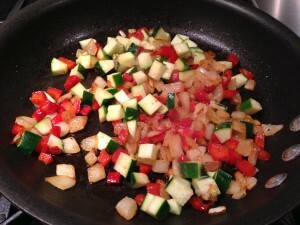 Add the diced zucchini to the onion/pepper mixture and saute for 3 minutes or until zucchini is just cooked. Set aside to cool. 7. 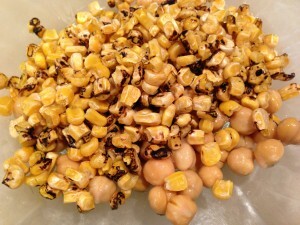 In a large non-metallic bowl, mix together the roasted corn, chickpeas, pine nuts, and chopped parsley. 8. Dice the cooled grilled chicken breast into 1/4 inch pieces. 9. 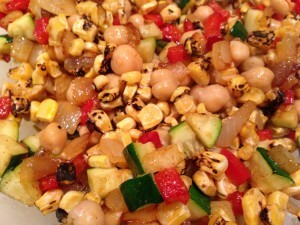 Combine the diced chicken breast and the onion/pepper mixture with the corn/chickpea mixture. Add the quinoa and stir well. 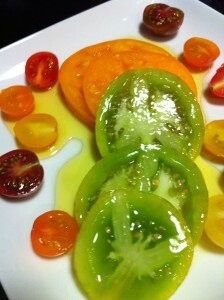 Mix in the oil and flavored vinegar. Season to taste with salt and pepper. 10. Cover and chill for 6 hours or overnight. Taste again before serving and adjust seasonings. 11. 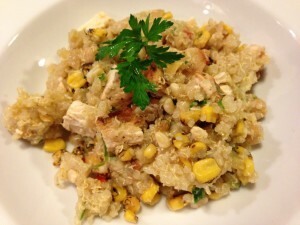 Divide chilled quinoa salad amongst four plates, garnish with parsley sprigs, and serve! Serves 4 as a main course. Serve alongside a roasted red pepper and white bean spread with pita bread for dipping. This salad can be served warm or chilled. I prefer it to be chilled as I think the salad tastes better. 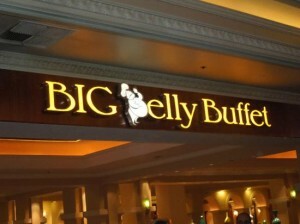 What a nice addition to a party buffet! Variations: You can omit the chicken for a vegan meal. 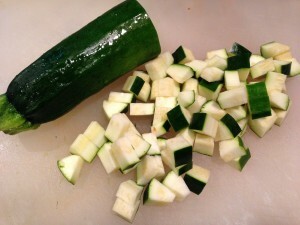 Add diced yellow squash along with the zucchini. Substitute couscous for the quinoa. Serve the salad over a bed of arugula or baby greens.